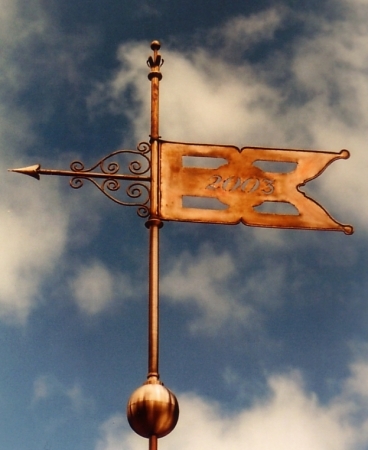 This banner Weathervane was originally commissioned as part of a matched set, with a different year cut into the surface on each banner. At the architect’s request, we added some optional custom ornamental metalwork above and below each banner. The price for this banner includes the sculpture piece itself and our standard hardware (stainless steel installation rod, large and small copper globes, solid brass directionals and pivot balls), but if you are interested in the additional ornamentation, we would be happy to provide you with a quote. Simple words or years can are cut through the surface of this banner, but keep in mind that the letters or numbers will read backwards when viewed from the opposite side. As a less expensive alternative, words or years can optionally be gold leafed onto the surface of the banner. This way, they will read correctly from either side. A banner is a flag often bearing a symbol, logo, slogan or other message. ‘Lucky Pennies‘ can be attached directly to the banner face if you choose to commemorate additional years. 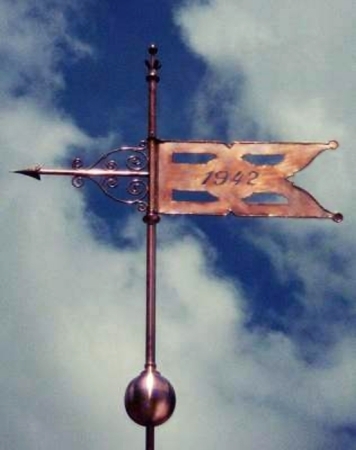 All of our weather vanes, in keeping with the Victorian tradition of annotation, have a penny from the year of creation affixed or inserted as part of the sculpture piece. Banner-making is an ancient craft. A heraldic banner, also called banner of arms, displays the basic coat of arms. Colleges have employed banners with their team sports, and trade unions adopted banners for their processions, most often on May Day celebrations. More recently, commercial businesses have used banners to build customer recognition and brand loyalty.